Well we have gone and done it and we are now on our way to New York. We decided not to buy the on-board internet package as we thought a week without emails and text messages would be more relaxing; so we are writing a bit each day and then we will post this on arrival in New York. 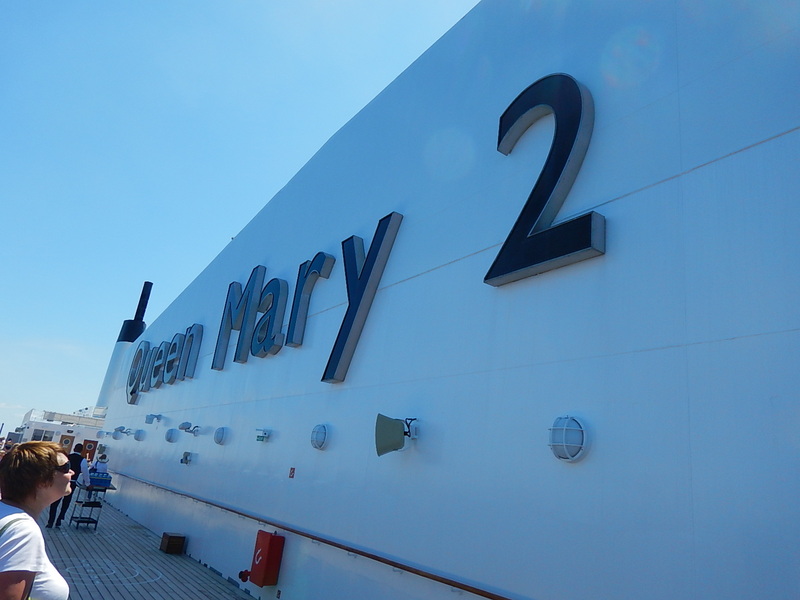 Our thoughts on crossing the Atlantic on Queen Mary 2, what a wonderful way to travel! Comfortable, civilised, no jet lag, what is not to like? We have seen pods of dolphins swimming alongside the ship, Mark spotted a whale (sorry Mia it disappeared to quickly to take a photograph) and we have marvelled at the mesmerizing ocean views which are truly breath-taking. What a fantastic way to start our trip. We arrived on board just after 15.00hrs and by the time we had found our cabin and settled in we heard from the captain that we were about to leave. We went on deck on the starboard side so we would see Hythe Pier and Calshot as we left. Why did I want to see Hythe Pier? Because my first teaching job in 1975 was in Fawley and I lived in Hythe for 4 years. The fifth year I lived in Southampton and cycled to work via the Hythe ferry. I used to see all the liners come in and out not realising that one day I would actually sail out on one bound for New York. While on deck we met Gail and Earl, a couple from California who are on their way home. When we were chatting and told them we were going to Penang they suggested we visit the Penang Adventist Hospital which Earls grandfather founded; we said we would try and do that and take a photo. We went to dinner after that and boy was it good! The service is excellent and the standard of the food is really high! How they do it for the number of passengers is a mystery. Every evening we receive a paper summarising the news headlines from the day before and a list of events and activities happening the next day. Much to my surprise Kim said she would like to go to the beginner’s bridge classes. So after breakfast we turned up, sat with Helen and Lyn from South Wales and had a real laugh. It was only an hour and it went really quickly. The weather was fantastic so once we had explored of the ship both inside and out we found a couple of steamer chairs on deck and gazed out to sea. We also walked three circuits of the promenade on deck 7, just over 1 mile and a great way to get some fresh air. Monday evening was a formal evening so we dressed up for dinner and popped in to the Ball later, didn’t stay as it was not really our scene!! Breakfast and then bridge with our new friends is how we start our day. While we were playing this morning the ship stopped for about an hour but we didn’t not feel any movement even with force 5 winds blowing. When we got underway again the weather started to change and in the evening we went into a fog bank and the ship used its fog horn, what an evocative sound that was! After dinner we went to see a film, I Saw The Light, with Tom Hiddleston; not bad and he was very good. For breakfast today we decided to try the self-service buffet area it is less formal than the restaurant and was very good. Bridge was moved today due to a wedding being held in the usual room on deck 11 so we had to find our way down to deck 2. At our third attempt we finally managed to get tickets for a planetarium show which was fantastic. We had a quick lunch and then Kim went to watch some students from RADA performing death scenes from Shakespeare (more fun than it sounds apparently, and quite appropriate to mark the 400th anniversary of his own death), she really enjoyed it. The weather has really deteriorated we now have overcast skies and force 7 winds but you would never know it, the ship cuts through the sea without any rocking or rolling. It is so smooth even Kim hasn’t felt sea sick. We talked to a lady who has travelled on many cruise ships and she says for any ocean crossing this is the one to travel on; good enough for us! At about 18:00hrs we entered some more fog and when we woke we were still in it, it cleared about 08:30. Apparently it blew up to force 8 during the night but Kim and I slept through it all. We had a look around the shops and bought a cap badge for $5, last of the big spenders. It was windy again but the boat still is very steady and you do not feel much motion. We chilled out this afternoon reading and watching the TV. At 7:00pm we were 100 nautical miles north of the Titanic wreck site; makes you think what it must have felt like when all you can see is ocean! After dinner I went to see Star Wars 7 in 3D and I enjoyed it, the best use of 3D I’ve seen. Kim declined my invitation to join me as she felt it scored too high on her furry feet index (FFI, the more characters with furry feet the worse the film!). Instead she went to see the RADA review about Cunard’s history, facts, etc. Today the weather was fantastic and it seems everybody took the chance to be out in the open to catch some rays. We went back to the planetarium to see another presentation which was as good as the first one. After dinner we went for a walk around the promenade deck and seemed to have it all to ourselves and then tried the port sampler in the Carinthia Lounge (four glasses to compare and contrast), which was excellent. Last full day at sea and so we thought we should try and get some washing done. We also had our final session of Bridge where we played a mini tournament and we didn’t disgrace ourselves. It was very windy, force 9, but we only knew that because it told us on the ship information TV channel. Had our final evening meal and said goodbye to the staff who have looked after us so well. We then packed our cases and put them outside our cabin, they were whisked away ready for us to collect ashore tomorrow. Finally, we broke open our complimentary bottle of champagne and enjoyed a last night drink. We woke up very early and stood on our balcony as we went under the Verrazano Narrows Bridge, with just 4m clearance for the funnel. We then had a quick shower and were back on the balcony in time to pass the Statue of Liberty at dawn. As the ship turned towards Brooklyn we got an amazing view of the Manhattan skyline at sunrise. We watched as the ship docked at the Brooklyn Cruise Terminal opposite Governors Island then had breakfast looking across the island with its trees and historic buildings and on to downtown Manhattan beyond. 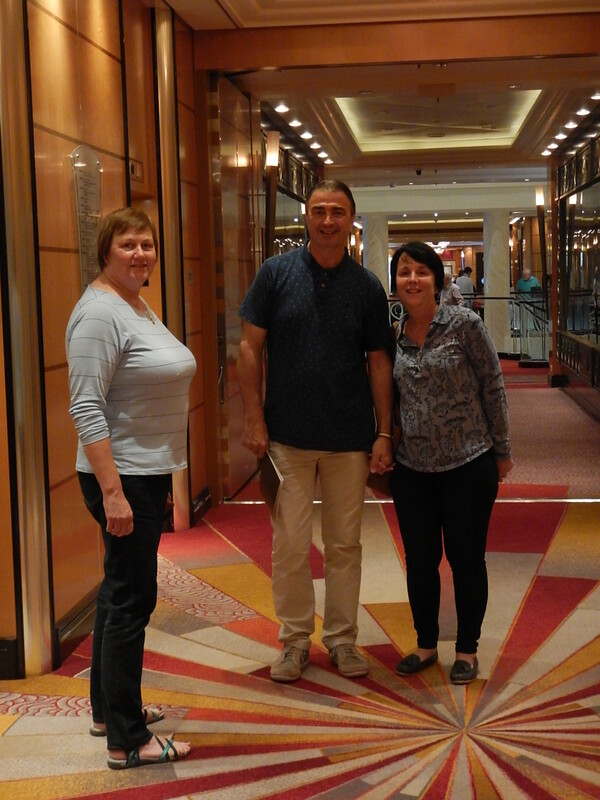 We took a stroll around the deck and bumped into our bridge buddies Helen & Lyn; who told us they had booked another cruise next year! We are now waiting to disembark and head for our hotel. What a fantastic experience this has been. We have not felt unwell once as this ship was built for this trip. 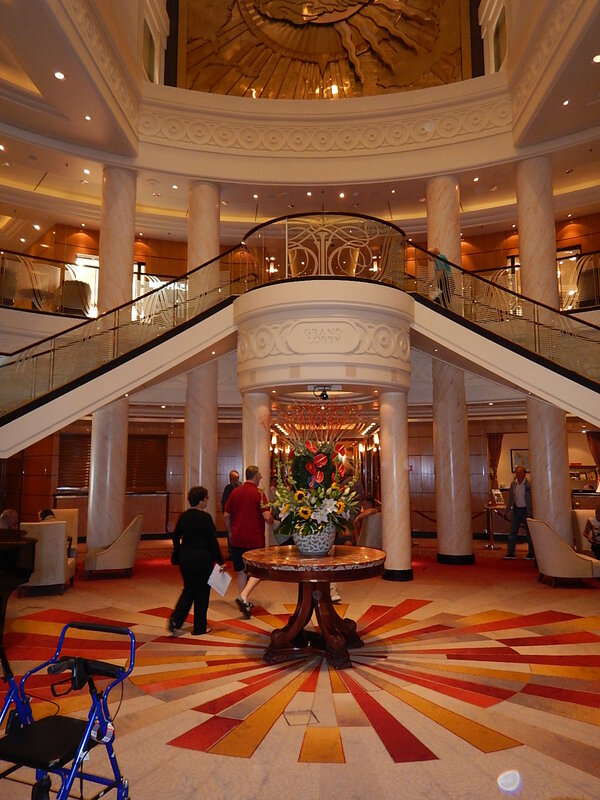 The service from Cunard has been first rate all the way through the whole process. Kim says she wants to do it again perhaps back the other way! If this is the sort of experience we are going to have on this adventure, bring it on!!! Sounds wonderful, what a treat! Wow, what a way to cross the pond, beats 17inches of leg room on a plane…..
Reading book and practicing on train!